WASHINGTON – Acting Veterans Affairs Secretary Sloan Gibson told a Senate committee Wednesday that the agency will need another $17.6 billion over the next three years to cut patient waiting times for the rising number of veterans. 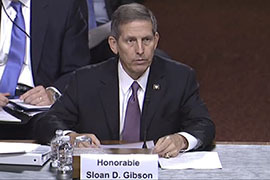 It was the first time Gibson had testified before a congressional committee since taking control of the troubled agency after the May 30 resignation of former Secretary Eric Shinseki. The tone of the hearing was largely supportive, but the price tag mentioned by Gibson raised some eyebrows on the committee. But the testimony comes at a time when Congress is considering a solution to the problems at the VA that could cost nearly twice as much as what Gibson said he needed. The House and Senate in recent weeks have passed slightly differing versions of bills that would expand VA facilities, reduce wait times for veterans seeking medical care and make it easier for vets to go outside the agency for treatment. But the Congressional Budget Office said in a July analysis that the bill would increase budget deficits by about $30 billion between 2014 and 2017. That bill is currently in a conference committee where House and Senate lawmakers – including Arizona’s Sen. John McCain and Rep. Ann Kirkpatrick – are trying to work out differences between the two chambers’ versions of the measure. “It’s important that the VA rebuild itself with authentic improvements in patient access and care options, modern technology, and appropriate increases in health providers and facilities,” said Kirkpatrick, a Flagstaff Democrat, according to an email from her office. The flurry of activity over the agency came after reports that veterans at VA medical facilities in Phoenix faced extraordinarily long waits for care, delays that were linked to some deaths, according to reports. Employees at those facilities were also accused of keeping separate sets of books to make waiting times look better than they actually were. The allegations sparked an national audit of the agency that found similar problems throughout the system, at a time when many agency executives were routinely getting thousands of dollars in bonuses. It forced the resignation of Shinseki – whose last act was to freeze bonuses. The $17.6 billion would cover new or expanded facilities and “approximately 10,000″ more medical staffers, including doctors and nurses said Gibson. Without the funds, he said wait times would just get longer. Senators at the hearing agreed that something must be done. Sen. Bernie Sanders, I-Vt., and chairman of the committee, said that more than 600,000 veterans currently have appointments scheduled 30 days from when they first requested them, and for 8,000 veterans the wait has been more than 120 days. 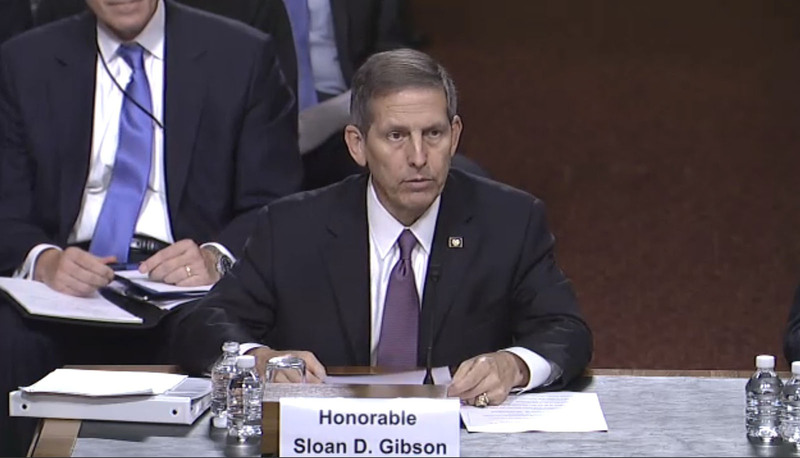 Acting Veterans Affairs Secretary Sloan Gibson told a Senate panel that it will take more than $17 billion over three years to fix problems at the agency that he inherited last month. A congreeional bill to address problems at the agency would cost at least $30 billion by one estimate.